Little, Brown and Company, 9780316031424, 592pp. In My Paper Chase, Harold Evans recounts the wild and wonderful tale of newspapering life. His story stretches from the 1930s to his service in WWII, through towns big and off the map. He discusses his passion for the crusading style of reportage he championed, his clashes with Rupert Murdoch, and his struggle to use journalism to better the lives of those less fortunate. There's a star-studded cast and a tremendously vivid sense of what once was: the lead type, the smell of the presses, eccentrics throughout, and angry editors screaming over the intercoms. My Paper Chase tells the story of Evans's great loves: newspapers and Tina Brown, the bright, young journalist who became his wife. In an age when newspapers everywhere are under threat, My Paper Chase is not just a glorious recounting of an amazing life, but a nostalgic journey in black and white. Harold Evans is the author of the New York Times bestseller The American Century. He was the founding editor of Conde Nast Traveler, editorial director of U.S. News & World Repor"t," and president and publisher of Random House, where he published a record number of bestsellers. He was editor of the London Sunday Times and of The Times. He lives in New York. "[My Paper Chase] is a fight song that revels in the music of times past...It celebrates bygone glories and dwells on the truths of good journalism that still obtain." 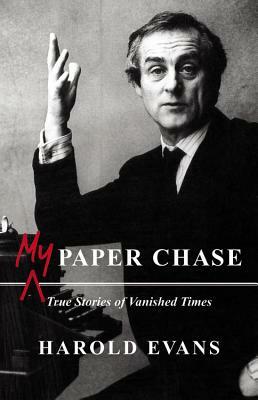 "Not only is [My Paper Chase] a loving homage to the joys of old-fashioned British newspapering, but it has allowed Mr. Evans to tell at proper length stories that should now be taught as classics in journalism schools worldwide." "Despite the title, Evans's memoir is more than relevant in the age of computer news; good reporting still demands what Evans exemplifies here-honesty, courage and dogged determination." "Old school newspapering comes alive in this scintillating memoir. Evans creates a lively, evocative portrait of 20th-century journalism...Written with self-deprecating humor and quiet conviction, this is a fine valedictory for a heroic style of journalism one hopes still has a future." "A refreshing memoir...[Evan's] jettisons hand-wringing over the 'vanished times' of its melancholy subtitle for one man's unquenchable enthusiasm for his life's work... My Paper Chase is the Gospel of Evans, and the gospel makes juicy copy." "Engaging...In this readable, almost wistful memoir, Sir Harold Evans remains the rare self-made Englishman who changed British journalism." "Evocative and enjoyable...Evans has a young man's perennial ­enthusiasm: he is 81 going on 18. Reading his autobiography, one quickly grasps how he became the most successful editor of his generation. He exudes a combination of boundless enthusiasm, relentless energy and an almost childlike delight in the sheer ­wonderfulness of newspapers. How can they not survive? ...one feels the warmth of his sunny personality even as the lights seem to be going out in much of print journalism. He saw the best of it - o, lucky man!" [My Paper Chase] is a work of extravagant exuberance. It is tough, optimistic, full of verve and friendship, written with clarity and energy, and goes like a train..."
""Inspiring" is an overused word. My Paper Chase truly is. Anyone who feels cynical about public life in general, and journalists in particular, should drink down this wonderful book in a single gulp. Harry Evans was the great crusader of the twentieth century British press. His memoir, which is also jaw-dropping social history, is the best education possible in what true journalism's all about." "SIR Harold "Harry" Evans remains one of the great figures of modern journalism. For this reason, and because the kind of campaigning, reporting-based work he stood for is threatened as never before, his autobiography, written as he turned 80, is both gripping and timely." "Like many others I was lucky to have worked with him. His book is illuminating and entertaining on his personal history and it gives a valuable record of what used to be known as English provincial life; more vital then, perhaps than now. But the important reason to read it is that it tells you how good newspapers were once made and why they still matter."